http://www.santacruzpumas.org/research/ buy now While Marty Fink and I were on patrol, we were struck by the fully exposed river bottom above Old Mission Dam. A small puddle of water was up against the dam on the north bank. Roughly 30 yards above the dam, a larger body of stagnant water was found. Sunning on some decaying plant life in the puddle, we saw a turtle that turned out to be a red-eared slider (Trachemys scripta elegans), also known as the red-eared terrapin. The name comes from the red stripe around the ears and the turtle’s ability to easily slide off rocks and logs back into water. http://sanfordbiggers.com/bio order now Sliders are poikilotherms, meaning that they are unable to regulate their body temperature and depend solely on the temperature of their environment. For this reason, they are often found sunning themselves to warm up before cooling down in the water. The red-eared slider is native to the southern United States and northern Mexico. In the United States, it is the most popular pet turtle and has become the most commonly traded turtle in the world. Because of pet releases, it has become an invasive species in many regions around the world. Wherever they have been introduced, the slider’s voracious appetite not only decimates native crayfish, snails, tadpoles, fish, and insects but also marine vegetation essential to sustaining native organisms. It has the distinction of being in the top 100 of all invasive species according to the International Union for Conservation of Nature (IUCN). click here The shell of turtles is divided into two parts. The dorsal, or upper part is called the carapace. The ventral, or bottom part is called the plastron. The carapace of red-eared sliders can reach 16 inches (40 cm) in length. 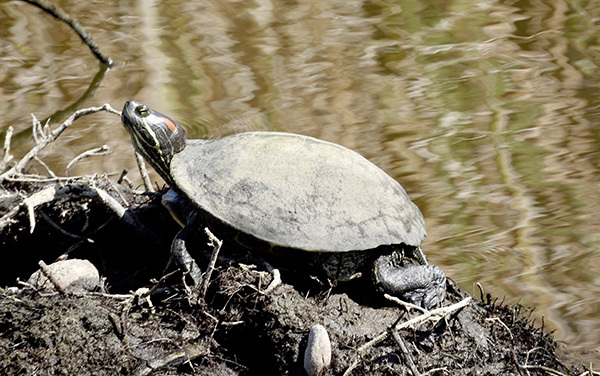 Since the red-eared slider is not native to our area, it (or its ancestor) was left to fend for itself by someone who could no longer care for it. It seemed to be enjoying the warm sunshine and was not disturbed by our presence. The native western pond turtle (Actinemys marmorata) is shy around humans and is not likely to be seen in Mission Trails. —George Varga is a trail guide at Mission Trails Regional Park.